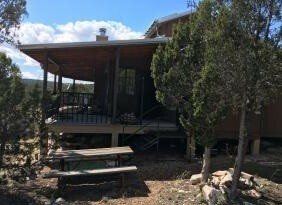 PRICE CUT CABIN 40 ACS DECK OFF GRID SELIGMAN AZ! Lot 87 Rick's Place Rd. Beautiful Hunters Cabin on 40.5 acres in 18A, off the grid, (Solar, wind turbine, generator power), 1250 gallon water tank provides gravity flow water to the cabin. PRICE CUT Cabin 40 Acs Deck Off Grid Seligman AZ! Community Water well is available until such time as you drill your own well. Access for hauling the water is easy and convenient. This 1000 sq ft cabin has a palatial Master suite on the main level and a very large bedroom in the loft. The living, dining and kitchen area is located in the very open plan over-looking the heavily treed sidehill and open very private meadow below. 2 wood burning fireplaces keep this cabin very comfy even under the coldest of evening temps. Ceiling fans in living room, master bedroom, and power room provides great air circulation for comfortable summertime temps. Hardwood floors in all rooms and tile in full bath make this charming and easy to keep spotless. Hook ups for washer and dryer are in the bathroom. A very large walk-in closet separates the Master bedroom from the utility room and additional rear access. A wrap around covered deck, completes the look and delivers an additional 1,000 sq ft of very enjoyable living space. PRICE CUT Cabin 40 Acs Deck Off Grid Seligman AZ! There is evidence of game literally all over the property deer, elk and other wildlife. Great Getaway or Year Round Living!